Easily storing the electric toothbrush and toothbrush heads. Protecting your toothbrush from getting lost or dirty. Made to fit Braun Oral-B Pro 1000 Power Rechargeable Electric Toothbrush Powered. The box is greatly fit for the people who are going to travel, camping, hiking or business trip. Note：Suitable for: Oral-B electric toothbrushes product of D12013 D12013W D12523 D12513.K DB4510 DB4010 DB4510.K D16.523U D20.545 D20.523 OC20, and Pro 600/650/1000/2000/3000 etc. 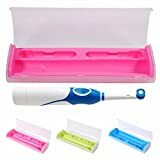 This entry was posted in Dental Shop and tagged accessories., BathRoom, Camping, Case, Electric, Hiking, Holder, HUELE, Portable, Toothbrush, Travel by Oral Health Care. Bookmark the permalink.